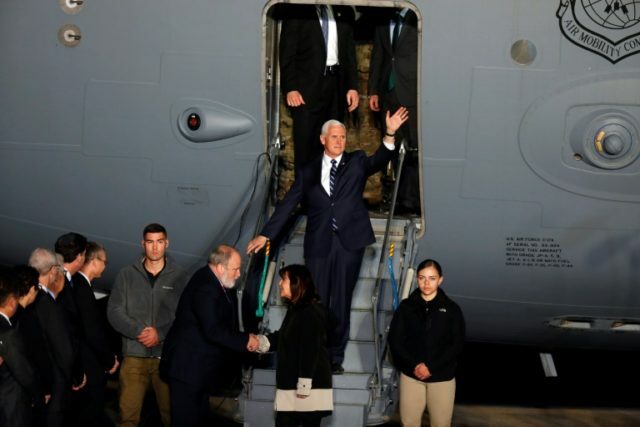 Tel Aviv (AFP) – US Vice President Mike Pence arrived in Israel on Sunday for a visit that will see him warmly welcomed by Israeli leaders but snubbed by the Palestinians, deeply angered by the White House’s Jerusalem recognition. Initially scheduled for December before being postponed, it is the final leg of a trip that included stops in Egypt and Jordan as well as a visit to a US military facility near the Syrian border. Pence received a red-carpet welcome at Tel Aviv’s Ben Gurion airport before entering his motorcade for travel to Jerusalem. Palestinian president Mahmud Abbas has cancelled a planned meeting with Pence over US President Donald Trump’s recognition of Jerusalem as Israel’s capital on December 6. Pence will meet Israeli Prime Minister Benjamin Netanyahu on Monday before addressing the country’s parliament later in the day — a speech that Israeli Arab lawmakers will boycott. On Tuesday, he will visit Jerusalem’s Western Wall, one of the holiest sites in Judaism, and the Yad Vashem Holocaust memorial before departing.